We are excited to announce that our boutique is now open for business. Located in the brand new Bow Market in the heart of Union Square, Somerville, MA. To find out more about our Retail Location, click the link below. Each piece is hand fabricated by Ashley Vick at her studio in Somerville, MA. 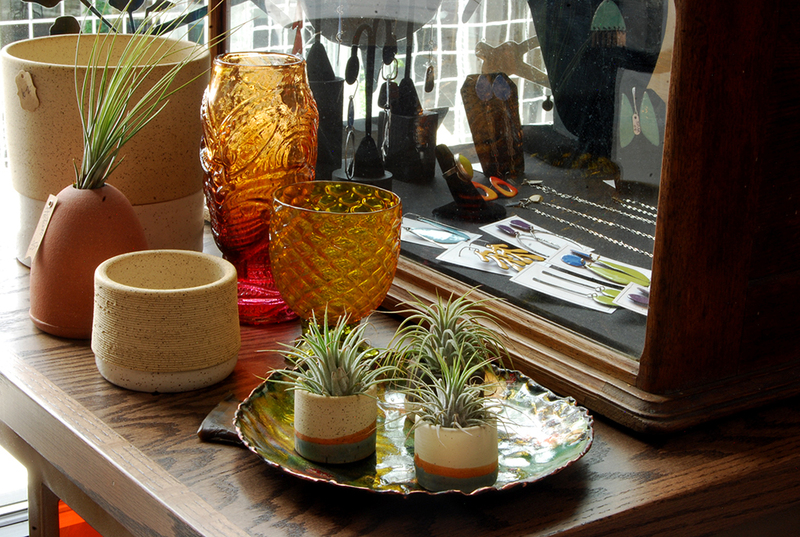 We've curated a collection of jewelry, clothing, art, and housewares by your favorite local artisans and MassArt graduates. We're constantly bringing in new people, keeping the store stocked and fresh. Filomena Demarco was my great-grandmother, an entrepreneur, who owned seven ice cream parlor's in Rhode Island in the early 1900s. I knew when opening my store, I wanted to create a family crest that represented the spirit behind Filomena Demarco. The ice cream cone in the center represents, Filomena. The feathers represent trust and honor. The antlers are a symbol for regeneration or spirit renewal. The metalsmithing tools; torch, hammers and anvil represent me and my craft. The gems represent the jewelry I make. And the ranunculus flowers, well they're just my favorite!